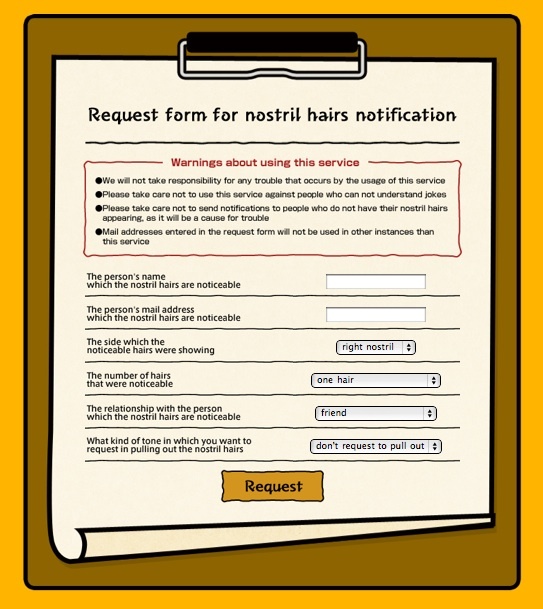 JAPAN Style shared the info about a nosehair notification service called “Chololi”. And today, we would like to introduce its English version. Now you can let your friends know about their nose hair situation with an anonymous English e-mail! [To Friend in Mild Tone] Excuse me, I have something to tell you as a friend. I noticed that there are 1 nostril hairs are sticking out from your right nostril. I do not care, but you look better without nostril hairs. [To Colleague in Strong Tone] Please do not get mad. I have something to inform you before everybody notices. I noticed that there are 1 nostril hairs are sticking out from your right nostril. If possible, would you be kind enough to pull out them? [To Boss in Commanding] Thanks for your effort. Though it apologizes on your precious time, I wish to confirm only one thing. I noticed that there are 1 nostril hairs are sticking out from your right nostril. Please pull them out right away. You must promise me. [To Girl/Boy Friend in Scornful] I love you, but to tell the truth…there is one thing that I cannot take it. I noticed that there are 1 nostril hairs are sticking out from your right nostril. I can’t stay with man who stick out hair from nose. Your nostril hairs will not be visible when I see you next time, won’t you? But not so many nose hairs have been exposed to their owners yet (only 162 nose hairs at this moment), so please do give it a try! There’s also a Chinese version.